Dr Gruman is a Professor of organizational behaviour, a CBE Senior Research Fellow, and serves as the Graduate Coordinator in the Organizational Leadership stream of the Ph.D. in Management. He has taught in the undergraduate program, MA Leadership Program, MBA program, and Ph.D. program in Management at the University of Guelph. Dr. Gruman has previously taught in both the Psychology Department and the Odette School of Business at the University of Windsor, and in the Psychology Department and the Department of Management at the University of Toronto. Additionally, he has instructed in the Business Studies Area at St. Clair College of Applied Arts and Technology, and in the Ontario Management Development Program. In addition to being a member of numerous professional associations, Dr. Gruman is the founding Chair of the Canadian Positive Psychology Association. He also blogs for Psychology Today and the Huffington Post. Dr. Gruman completed his doctoral internship at Jackson Leadership Systems, a consulting firm specializing in leadership assessment and development. His research and writing has been covered by media outlets around the globe including CBS-, NBC-, and Fox-affiliated stations, in addition to Business Insider and U.S. News & World Report. In Canada he has been profiled and quoted in print and online magazines such as MoneySense Magazine, Chatelaine, and Canadian Business, trade publications such as HR Professional, newspapers such as The Globe and Mail and National Post, and has appeared on CTV’s Canada AM, Global News, Report on Business Television and has been syndicated on CBC radio. 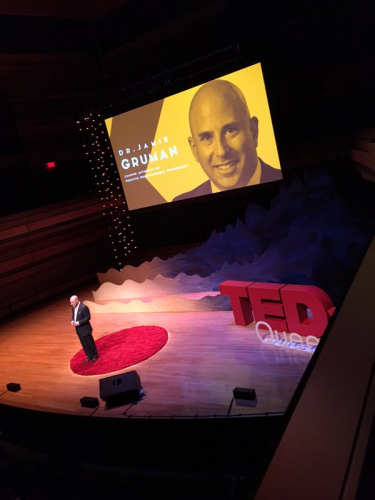 In addition to speaking at numerous academic conferences (e.g., Academy of Management) and practitioner conferences (e.g., Conference Board of Canada, TEDx), Dr. Gruman has consulted and delivered seminars for Fortune 500 corporations, public, and not-for-profit agencies including General Motors, The Canadian Federal Government, and The Children’s Wish Foundation. In 2018 Dr Gruman was awarded a CBE Senior Research Fellowship, the College's most prestigious research award. Dr. Gruman's 2015 co-authored article entitled “Employee Engagement, Human Resource Management Practices and Competitive Advantage: An Integrated Approach” published in Journal of Organizational Effectiveness: People and Performance was selected by the journal’s editorial team as the Outstanding Paper in the 2016 Emerald Literati Network Awards for Excellence. In 2013, his co-authored article, "Performance Management and Employee Engagement" was the most downloaded article in Human Resource Management Review, and is one of the most downloaded articles among all journals published by Elsevier. Five years later, the article continues to be the most downloaded paper at the journal. In 2009 Dr. Gruman was awarded a Distinguished Professor Award from the Faculty Association at the University of Guelph in recognition of his commitment to innovations in university pedagogy and research on university education. In 2007 Dr. Gruman earned an award from the Human Resources Division of the Administrative Sciences Association of Canada for a paper he co-authored examining the effects of diversity in organizations. 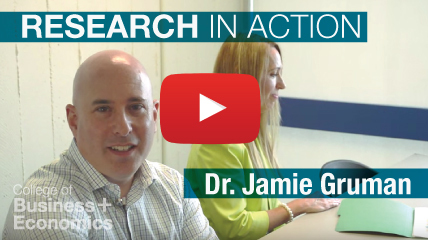 Dr. Gruman’s current research interests focus on well-being in the workplace. Among his current research and writing projects are those related to the emerging field of positive organizational behaviour which explores the effect of hope, optimism, confidence, and resilience among employees. He has also conducted, or is currently conducting, research on employee engagement, workplace spirituality and general workplace well-being. Much of Dr. Gruman’s work focuses on how the organizational on-boarding process can be designed to promote positive outcomes among newcomers. He is co-developer of Socialization Resources Theory, The Engagement Management Model, the concept of E-socialization, and the ReNU model of effective leisure time recovery, which is discussed in his latest book entitled Boost: The Science of Recharging Yourself in an Age of Unrelenting Demands. Saks, A. M., & Gruman, J. A. (2018). Socialization resources theory and newcomers' work engagement: A new pathway to newcomer socialization. Career Development International, 23, 12-32. Gruman, J. A., Lumley, M. N., & Gonzalez-Morales, M. G. (2018). Incorporating Balance: Challanges and Opportunities for Posiitve Psychology. Candian Psychology, 59, 54-64. Albrecht, S., Bakker, A., Gruman, J. Macey, W., & Saks, A. (2015). Employee engagement, human resource management practices, and competitive advantage: An integrated approach. Journal of Organizational Effectiveness: People and Performance, 2, 7-35. Saks, A. M., & Gruman, J. A. (2014). What do we really know about employee engagement? Human Resource Development Quarterly, 25, 155-182. Scott, K., Heathcote, J., & Gruman, J. A. (2011). The diverse organization: Finding gold at the end of the rainbow. Human Resource Management, 50, 735-755. Saks, A, M., Gruman, J. A. & Cooper-Thomas, H. (2011). The neglected role of proactive behavior and outcomes in newcomer socialization. Journal of Vocational Behavior, 79, 36-46. Saks, A.M., & Gruman, J. A. (2011). Manage employee engagement to manage performance. Industrial and Organizational Psychology: Perspectives on Science and Practice, 4, 204-207. Saks, A. M., & Gruman, J. A. (2011). Getting newcomers engaged: The role of socialization tactics. Journal of Managerial Psychology, 26, 383-402. Gruman, J. A., & Saks, A. M. (2011). Performance management and employee engagement. Human Resources Management Review, 21, 123-136. Gruman, J. A., Chhinzer, N., & Smith, G. W., (2011). An exploratory study of the level of disaster preparedness in the Canadian hospitality industry. International Journal of Hospitality and Tourism Administration, 12, 43-59. Saks, A. M., & Gruman, J. A. (2011). Organizational socialization and positive organizational behaviour: Implications for theory, research, and practice. Canadian Journal of Administrative Sciences, 28, 4-16. Bors, D. A., Gruman, J. A., & Shukla, S. (2010). Measuring tolerance of ambiguity: Item polarity, dimensionality and criterion validity. European Review of Applied Psychology, 60, 239-245. Gruman, J. A., Cribbie, R. A. & Arpin-Cribbie, C. (2007) The effect of heteroscedasticity on tests of equivalence. Journal of Modern Applied Statistical Methods, 6, 133-140. Gruman, J. A., Saks, A., & Zweig, D. (2006). Organizational socialization tactics and newcomer proactive behaviors: An integrative study. Journal of Vocational Behavior, 69, 90-104. Cribbie, R., Gruman, J., & Arpin-Cribbie, C. A. (2004). Recommendations for applying tests of equivalence. Journal of Clinical Psychology, 60, 1-10. Cramer, K., & Gruman, J. (2002). The Lennox and Wolfe revised self-monitoring scale: Latent structure and gender invariance. Personality and Individual Differences, 32(4), 627-637. Rotenberg, K., Gruman, J., & Ariganello, M. (2002). Behavioural confirmation of the loneliness stereotype. Journal of Basic and Applied Social Psychology, 24(2), 81-89. Gruman, J., & Healey, D. Boost: The Science of Recharging Yourself in an Age of Unrelenting Demands. Charlotte, NC: Information Age Publishing. Gruman, J., Schneider, F., & Coutts, L. (Eds.). (2012). Applied Social Psychology: Understanding and Addressing Social and Practical Problems, 3rd Ed.. Thousand Oaks, CA: Sage Publications. Gruman, J. A. & Saks, A. M. (2018). E-socialization: The problems and the promise of socializing newcomers in the digital age.In J. H. Dulebohn & D. L. Stone (Eds. ), The Brave New World of eHRM 2.0. Information Age Publishing. Saks, A. M., & Gruman, J. A. (2018) Human resource management and employee engagement. In P. Sparrow & C. L. Cooper (Eds. ), A Research Agenda for Human Resource Management. Edward Elgar. Saks, A. M., & Gruman, J. A. (2017). Implications of positive psychology and psychological capital for learning and training. In K. Brown (Ed. ), The Cambridge Handbook of Workplace Training and Employee Development. Cambridge University Press. Gruman, J. A., & Saks, (2015). Being psychologically present when speaking up: Employee voice engagement. In T. Dundon (Ed. ), Handbook of Research on Employee Voice. Edward Elgar. Gruman, J. A., & Saks, A. M. (2013). Psychological Capital and Newcomer Well-Being: A New Perspective on Organizational Socialization and Newcomer Adjustment. In A. B. Bakker, (Ed. ), Advances in Positive Organizational Psychology, Emerald. Saks, A. M., & Gruman, J. A. (2012). Getting newcomers on-board: A review of socialization practices and introduction to Socialization Resources Theory. In C. Wanberg (Ed.). The Oxford Handbook of Organizational Socialization. Oxford: Oxford University Press. Coutts, L., & Gruman, J. (2012). Applying social psychology to organizations. In F. Schneider, J. Gruman, & L. Coutts (Eds. ), Applied Social Psychology: Understanding and Addressing Social and Practical Problems, 2nd Ed. Thousand Oaks, CA: Sage Publications. Schneider, F., Gruman, J., & Coutts, L. (2012). Defining the field of Applied Social Psychology. In F. Schneider, J. Gruman, & L. Coutts (Eds.). Applied Social Psychology: Understanding and Addressing Social and Practical Problems, 2nd Ed,. Thousand Oaks, CA: Sage Publications. Saks, A. M., & Gruman, J. A. (2010). Organizational socialization and work engagement. In S. Albrecht (Ed.). The Handbook of Employee Engagement: Models, Measures, and Practice. Edwin-Elgar Publishing House. Gruman, J. A., Saks, A. M., & Crerar, A. (2011). Applied learning projects and the development of psychological capital among undergraduate business students. Proceedings of the Administrative Sciences Association of Canada Annual Conference, Montreal, Quebec. Scott, K., Heathcote, J., & Gruman, J. (2007). Diversity management practices: Comparing Cox and Blake’s recommendations to current research and practice. Proceedings of the Administrative Sciences Association of Canada Annual Conference, Ottawa, ON. Gruman, J. A., & Saks, A. M. (2005). Organizational socialization tactics and newcomer proactive tactics: An integrative study. Proceedings of the Administrative Sciences Association of Canada Annual Conference, Toronto, Ontario. Gruman, J. A. & Bors, D. A. (July 20, 2012). Do nothing, Be happy: Halcyonic well-being. Paper presented at the inaugural meeting of the Canadian Positive Psychology Association, Toronto, ON. Saks, A. M., & Gruman, J. A., (August, 2012). Socialization Resources Theory: A new approach to socialization research and practice. In C. Wanberg (Chair). Organizational socialization: Taking the next steps. Symposium conducted at the annual meeting of the Academy of Management, Boston, MA. Gruman, J. A. & Saks, A. M. (June 2, 2011). Socialization and the psychological capital of newcomers. In A. Saks (Chair). Positive organizational psychology: New directions for research and practice. Symposium conducted at the annual meeting of the Canadian Psychological Association, Toronto, ON. Gruman, J. A., Saks, A. M., & Crerar, A. (July 4, 2011). Applied learning projects and the development of psychological capital among undergraduate business students. Paper presented at the Annual Meeting of the Administrative Sciences Association of Canada, Montreal, Quebec. Gruman, J. A., & Saks, A. M. (July 5, 2011). Socialization preferences and intentions: Does one size fit all? Paper presented at the Annual Meeting of the Administrative Sciences Association of Canada. Montreal, Quebec. Saks, A. M. & Gruman, J. A. (2010, August). Getting newcomers on-board: What’s an organization to do? Paper presented at the Annual Meeting of the Academy of Management, Montreal, Quebec. Gruman, J. A., & Saks, A. M. (2010, June). The effect of on-boarding practices and employee engagement on employee retention in the hospitality industry: preliminary results. Paper presented at the Harrah Hospitality Research Summit, Las Vegas, Nevada. Gruman, J. A., & Saks, A. M. (2009, August). Promoting positive organizational behavior through organizational socialization. Paper presented at the Annual Meeting of the American Psychological Association. Toronto, Ontario. Saks, A. M., & Gruman, J. A. (2009, June). An investigation of proactive socialization outcomes. Paper presented at the Annual Meeting of the Administrative Sciences Association of Canada. Niagara Falls, Ontario. Gruman, J. A., & Bors, D. (2008, May). Measuring tolerance of ambiguity: Item polarity, dimensionality and criterion validity. Paper presented at the annual meeting of the Administrative Sciences Association of Canada, Halifax, NS. Gruman, J. A., Chhinzer, N., & Smith, G. Disaster preparedness in the Canadian hospitality industry. (2008, May). Paper presented at the annual meeting of the Administrative Sciences Association of Canada, Halifax, NS. Saks, A. M., & Gruman, J. A. (2008, May). An investigation of the socialization and work engagement of newcomers. Paper presented at the annual meeting of the Administrative Sciences Association of Canada, Halifax, NS. Shukla, S., Bors, D. A., Armstrong, B. C., & Gruman, J. A. (2008). The Meaning of Life Questionnaire: Exploring meaning from a cognitive perspective. Paper presented at the Annual Conference of the Canadian Society for Brain, Behaviour and Cognitive Science. London, Ontario. Cribbie, R. A., Arpin-Cribbie, C. A., & Gruman, J. A. (2007). Equivalence tests for one-way independent groups designs. Paper presented at the Annual Meeting of the Eastern Educational Research Association, Clearwater, FL. Cribbie, R. A., Arpin-Cribbie, C. A., & Gruman, J. A. (2007). Tests of equivalence in psychological research. In D. Jackson (Chair), Recent developments in analyzing psychological data: Inferential statistics. Symposium conducted at the annual meeting of the Canadian Psychological Association, Ottawa, ON. Gruman, J. A., Heathcote, J., & Scott, K. (2007). Cox and Blake revisited: Empirical evidence for the advantages of diversity in organizations. Paper presented at the annual meeting of the Academy of Management, Pittsburgh, PA.
Gruman, J. A. (2006). Implementing work-based learning in management courses. Paper presented at the University of Toronto Conference on Scholarship, Leadership, and Innovation, Toronto, Ontario. Cribbie, R. A., Gruman, J. A., & Arpin-Cribbie, C. A. (2005). Effects of variance heterogeneity on tests of equivalence. Paper presented at the Annual Meeting of the American Educational Research Association, San Francisco, CA. Gruman, J. A. & Bors, D. (2005). Two test of tolerance for ambiguity: A psychometric study. Paper presented at the annual meeting of the Canadian Society for Brain, Behavior and Cognitive Science, Montreal, Quebec. Gruman, J. A., & Reavley, M. A. (2005). Work-based learning in the teaching of organizational behaviour. Paper presented at the annual meeting of the Administrative Sciences Association of Canada, Toronto, Ontario. Shukla, S., Bors, D., & Gruman, J. A. (2005). Guessing behaviour on the mental rotation test: If at first you don’t succeed try, try again. Poster presented at the annual meeting of the Canadian Society for Brain, Behavior and Cognitive Science, Montreal, Quebec. Miller, D., Stainton, M. & Gruman, J. (2001). Flow experiences of executives: An investigation using the experience sampling method. Poster presented at the annual meeting of the Canadian Psychological Association, Quebec City, Quebec.